Folkmanis 2974 - This fascinating creature is true to life with vivid coloration and eight movable arms. Each arm is operable with printed suction cups on the underside. 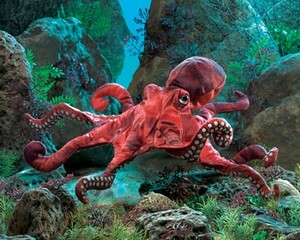 Easy to wriggle around, the RED OCTOPUS PUPPET literally fits like a glove, instantly coming to life. Measures 19” long, 19” wide, 4” tall. Glove puppet with six legs. Fits on right or left hand.